The Christmas season comes to customary end on January 6th with the celebration of Epiphany or Three Kings Day. Epiphany commemorates the manifestation of Jesus and the visit of the Magi (Wise Men). They traveled to Bethlehem to worship Jesus after viewing the star, a shining light that revealed Jesus' birth (Matthew 2:1-12). In telling the Christmas story, many children's books show three wise men visiting the stable shortly after Jesus' birth. Interestingly enough, the Biblical passages are rather vague and never specifically state the actual number of wise men or their date of arrival. The verses only tell that the Magi brought three gifts to Jesus: gold, frankincense and myrrh. The stable also is not mentioned. They entered the "house" and saw the child with his mother. 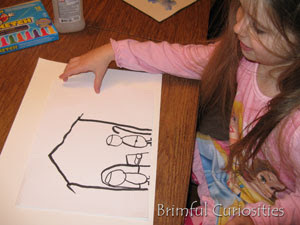 Are there any children's books that show the Magi visiting Jesus at a house and not a stable? Or with a different number of wise men? Bookie Woogie recently reviewed The Little Drummer Boy by Ezra Jack Keats, a book that, according to them, shows more than three wise men. As for a house instead of a stable, I'm not sure, so I'll have to refer to my readers for further book suggestions. 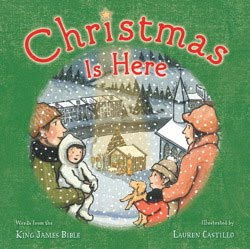 This Christmas my family discovered a newly published Christmas picture book by Lauren Castillo. In Christmas is Here, the wise men do not make an appearance at the stable. I want to make mention of it now because I think the book deserves a lot more attention that it received over the holidays. It is a book worth owning if you celebrate Christmas and makes a splendid read-aloud on Christmas Eve, especially if you already read the story from the Bible. What makes Christmas is Here truly special is that Castillo merges past with present. She tells the Christmas story starting in the present time with a family that goes to see a live Nativity. As the little child in the story peers over the crib and looks down on baby Jesus the focus changes and the following pages powerfully depict the Biblical text taken directly from the King James Bible about the shepherds and angels and the birth of Jesus, the passages of Luke 2:8-14. In the end, as the text tells of the armies of heaven praising God, Castillo takes readers back to the present day with a gorgeous illustration showing the family and others gathered around the live Nativity as they join in the chorus of praise. Christmas is Here ranks high on my list of favorite children's Christmas picture books, and I suspect that it will become a staple in home libraries in the years to come. Both young and old can find meaning in the story and the illustrations make the Biblical text very accessible to younger children without having an unrealistic, childish cuteness like so many other versions. I'm particularly impressed with the detail and magnitude surrounding the angel's visit to the shepherds. Castillo effectively shows their surprise and shock and joy. The manger scene glows with a magnificent warmth, and I especially love the quaint rural setting of the live Nativity. This inspiring book truly helps families focus on the real meaning of Christmas, and I highly recommend it. Lauren Castillo creates her illustrations using acetone transfers, ink and watercolor. Up to this point I had never heard of acetone transfer. She explains the printmaking technique on her blog and it involves transferring a photocopied drawing onto another piece of paper by rubbing an acetone solvent on the back of the photocopy. The resulting image looks a bit like a woodblock print. 1. 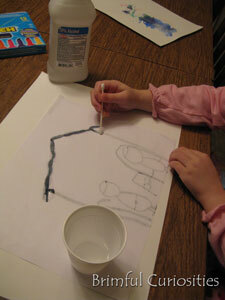 Draw picture on copy paper using watercolor markers. 2. 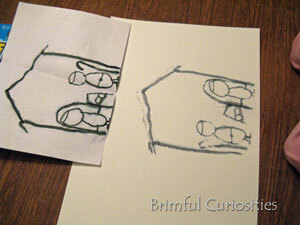 Flip drawing over and place on a piece of watercolor paper. 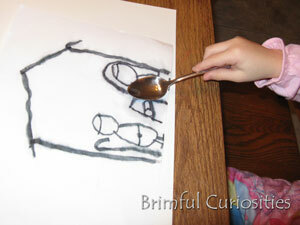 Apply a small amount of rubbing alcohol to the backside of the drawing using a cotton swab. 4. Remove copy paper and view your mirrored duplicate image. 5. Color in image and add further detail. My toddler son wanted to transfer his picture, too. We sprayed water on the backside and transferred it using the steps above. Water causes the image to bleed, resulting in a blurry transfer. A Mommy's Adventures hosts the "stART" meme (Story + Art) each week. 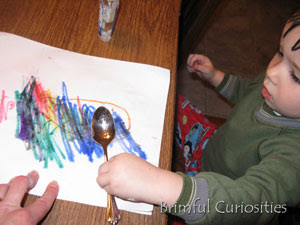 Add your kids craft post to the Kid's Get Crafty linky at Red Ted Art's Blog. 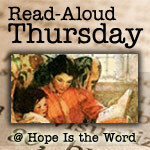 Join in Read Aloud Thursday at Hope is the Word. Show off your ideas at ABC & 123 Show and Tell. Oh Wow! What a clever idea! I love it. I bet the kids loved this project. I vaguely remember doing transfers from magazines like this and it worked so well. Will have to investigate that technique again! Thank you for linking up!!! We really enjoyed this book too. I love your art project! This sounds like a great book. I'm sorry we missed it this year, but I'll have to remember it for next season. We really enjoyed First Night this season. Loved the activity you did with the kids as well! Tomie does it well. In "The Story of the Three Wise Kings" they come to "the place" and Mary is pictured with The child Jesus (not an infant) in a traditional pose, "Seat of Wisdom, Throne of Justice". There is no evidence of it being a stable (animals, shepherds, hay, manger...) in "Mary, The Mother of Jesus", the scripture is quoted, "Entering into the house" and Mary and the child are depicted in a house. Also, this is AFTER The Presentation. Tomie's "Book of Bible Stories" also separates "Jesus Is Born" from "The Visit of the Magi", but he does draw Mary and the infant in the stable. He also notes that in early art, 2-4 kings were shown, but 3 persisted due to the 3 gifts Matthew documented. Not sure about other books that show more/fewer than 3. Love your art stuff, btw. I was just commenting on someone else's blog that I want to get better about recognizing Epiphany, etc. and taking more notice of the accurate stories from history, like you've mentioned. I'd really like to get this book. 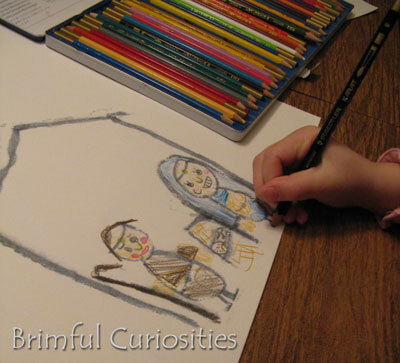 I'd also really like to do this art project. I loved watching your project unfold. I will try this project with my daughter. And we have a Christmas board book that shows the wise men visiting Jesus in a house, not the stable. But I can't recall the title. We love this book! Your transfer art activity looks really neat, too! I love picture books and love to buy them for gifts (wouldn't admit to keeping any for myself) and for the grandkids to enjoy here. It's neat to see the project progression. It delights me when mothers allow the younger ones to do a project the olders are doing. Love Lauren Castillo so much and this is a great book of hers. Thanks for linking up to The Children's Bookshelf. Pinning this, too.